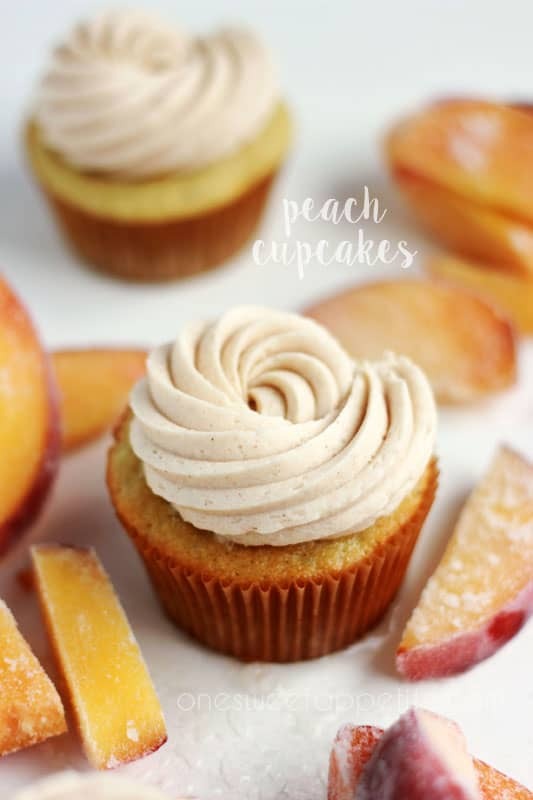 These homemade peach cupcakes are filled with a sweet peach curd and topped with cinnamon frosting – making it the perfect peach cobbler cupcake recipe! 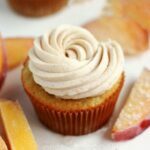 These Peach Cupcakes are topped with a cinnamon frosting and taste exactly like mini peach cobblers! Delicious and sure to disappear in seconds! It has been a while since I have made a good cupcake. Luckily, I have a very vocal sister that put me in my place and let me know that I needed to get my $%*@ in gear and get her a delicious peach dessert. I decided to go with peaches because they are going to be in season soon and I had a freezer full from last year. The cake itself is amazing- Moist, fluffy, and delicious. I wanted a real punch of peach which is why I decided to use the peach puree center. 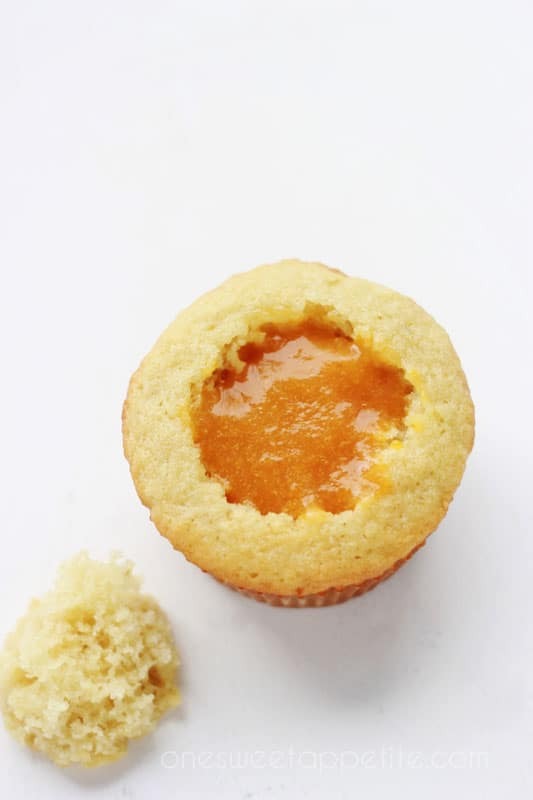 When you fill a cupcake with a fruit puree or curd it seeps into the sponge of the cake taking the flavor from an eight to a ten. It also really keeps the cupcakes from drying out giving them a longer shelf life. I consider this a double win. There were a few options I considered for the frosting. You can go with traditional vanilla or, to give it a cobbler taste, a cinnamon buttercream! You will love the addition of spice mixed with the sweet flavor of peach. It really is like a bite of cobbler disguised as a cupcake! 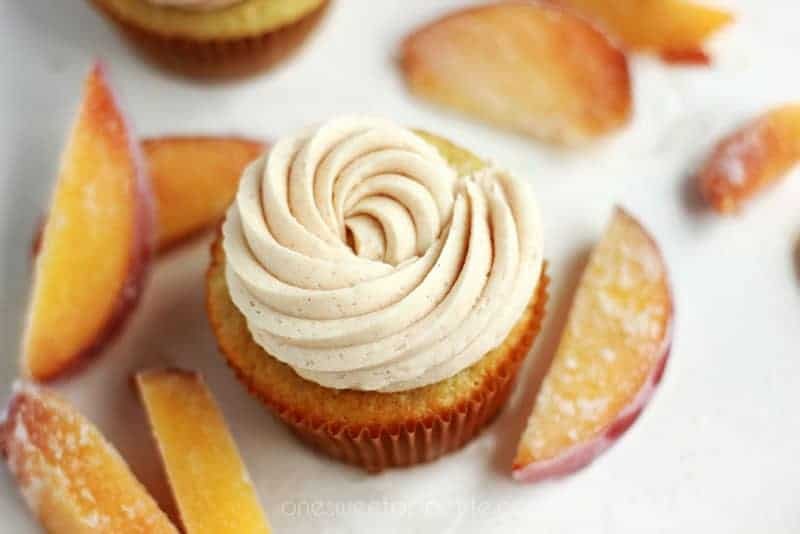 These fall peach cupcakes are filled with a sweet peach curd and topped with cinnamon frosting - making it the perfect peach cobbler cupcake recipe! 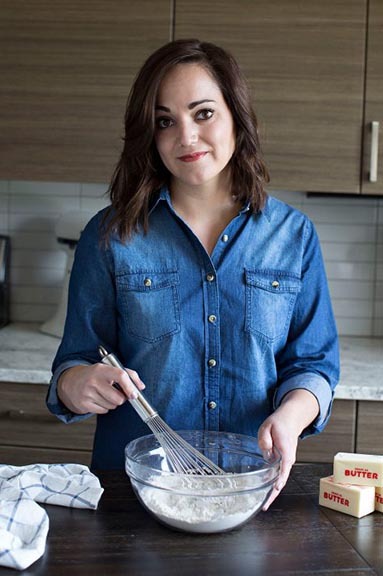 Whisk together the flour, baking powder, baking soda, and salt in a medium sized bowl. Set aside. Cream together the butter and sugar in the bowl of an electric mixer until light and fluffy. Add the egg, vanilla, and peach schnapps until fully combined. Slowly add the milk and puree and continue to stir until smooth. Fold in the dry ingredients. Fill the liners 3/4 full. Bake 15-20 minutes or until a toothpick comes out clean. Cool on a wire rack. Puree the peaches in a blender until smooth. Pour into a saucepan with the sugar and bring to a boil. Whip the butter with an electric mixer until light and fluffy. Slowly stir in the powdered sugar, vanilla, and cream. Whisk until light and fluffy and fully combined, making sure to scrape the sides of the bowl. Stir in the cinnamon. These cupcakes are beautiful! I love the filling and the cinnamon is definitely the perfect touch. May i know what piping tip you used and the size of it? I used a 1M tip. How did you make those sugared peaches featured in the photo?? I would love to top my cupcakes with those for added decoration! !